As our population becomes increasingly more urban, more and more people want to get away from it all and go camping. However, our bodies have become accustomed to the sweet softness of cushiony mattresses. Fortunately, air mattresses allow you to bring the comfort of your bed along with you as you go camping. But, what is the best air mattress for camping? There are several different types of air mattresses. The one that is right for you will depend on your specific needs. Before I review my favorites, I want to give you a little crash course on what to look for when shopping for air mattresses. The type of camping you plan on doing will determine what inflation method is best for your purposes. If you are camping close to where you park your vehicle, then an electric pump mattress will be great. On the other hand, the bulkier electric pump will be difficult to transport if you have a long walk to your campground. In this instance, a mattress with a hand or foot pump would be preferable. Electric pumps come with either AC or DC plugins. An AC electric pump requires a wall outlet or generator while the DC electric pumps draw power from your vehicle’s 12V, or cigarette lighter, outlet. Some air mattresses run off of 4D batteries and have the pump built in. When you have no access to your car’s 12V outlet or other power outlets, the luxury of an easily inflatable air bed is perfect. Finally, there are the easy to handle and lightweight self-inflating mattresses. Consider these for your long distance hikes and treks. They are better than the cold, rocky ground, but in general, self-inflating air beds are not the most comfortable. How Heavy of a Mattress Do You Need? Due to the materials used in the construction of air mattresses, there are heavy and light varieties. A heavier mattress is preferable if comfort is your main concern. This is because they are made of a thicker, more comfortable material that is also more durable. People who have kids or who camp close to home often choose these beds. You should consider a lighter weight air mattress if you are the type of camper who wants to trek out, rock climb, or hike rather than spend all of your time sleeping in a tent. Though the lightweight mattresses are typically less durable, they are more convenient and portable. These air beds will still last you for a long time as long as you do not have the kids jumping on them. Trying to fit a queen size air mattress into a small tent that does not have room for a queen-sized mattress is going to have some negative repercussions. You will not have room to store other supplies or to walk around your tent. Plus, the mattress may bulge out of the sides. So, be sure to take some measurements before making a purchase. Air beds also come in a variety of different thicknesses. The raised type is the most common. You can find these in the same height as the bed you have at home. They make getting into and out of bed much easier. They are sometimes adjoined to their own platform and are designed to keep you away from the floor. These mattresses are best when used close to home or when you do not have to carry them very far. The low profile air mattresses are smaller and less expensive. They are often easy to fit in a backpack. If you want a combination of comfort and portability, consider a low profile air bed. You need to take your tent into consideration when choosing the best air mattress for camping. In addition to the size of your tent, think about where in your tent you will be placing your mattress and if it will fit. Whether you are working with a tight budget or you have a little extra money to spend, there are camping air mattress prices that run the gamut. Though they can be advantageous in certain situations, the lower cost beds normally have less durability and fewer convenient features. For instance, you do not want to spend additional cash on an expensive air bed that comes with an electric pump when you already have one. You can put your existing pump to use and save some money by buying the cheaper camping air bed that does not have its own pump. What About When You Are not Camping? Most people will keep their air mattress in storage between camping trips. Others may want to consider using their mattress as a guest bed. If this is a possibility, you will want to think about your guests’ comfort when making your purchase as well as where the air bed will be used. If guests definitely will not be using your air mattress, then ease of storage between camping trips is more important. Many air mattresses of all sizes come with compact carrying bags or cases. Customer comfort and a quality sleeping experience are the main goals of the SoundAsleep brand. One of their top offerings is the Dream Series air mattress. The top features for this air bed are the patented ComfortCoil Technology and internal high capacity pump. The ComfortCoil Technology offers exceptional support and comfort by using 40 air coils. The Dream Series mattress stays firm throughout the night and remains inflated thanks to the ComfortCoil. It is also easy to get in and out of the Dream Series bed since it is made in double height form factor. Campers who want to bring the comfort of home with them on their trip should consider this mattress. There are several features that make this mattress attractive. First of all, it is self-inflating, which is helpful after a long day of hiking. All you have to do is unroll it, and it inflates. The pressure mapping system provides more support and allows for less foam density in high-pressure areas. The fabric cover of the air mattress is soft and plush. Backpackers, hikers, and climbers would benefit from this air bed due to its lightweight design. You can easily stuff this into the compact sack it comes with and hit the road. 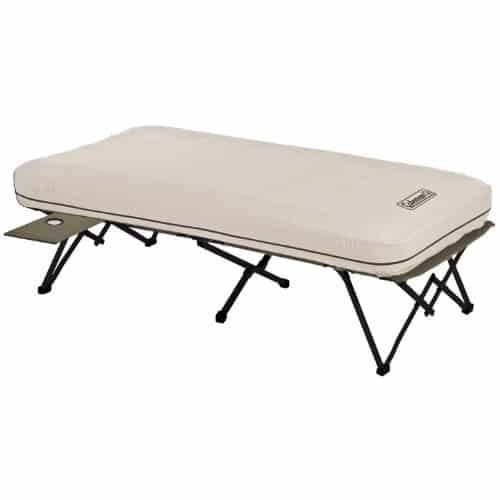 The Coleman Airbed Cot is a great multipurpose air mattress that can serve as an indoor makeshift bed when guests drop by as well as an excellent camping bed. You can expect the support and feel of a real bed with the detachable elevated cot. A rare convenience found with the Airbed is the side tables that come attached. It also is one of the longest lasting air mattresses on the market thanks to the cot keeping it safe from leaks and cuts. Though it may require periodic refills, this air bed will comfortably take the weight of two people. Shoppers who want an air mattress that offers comfort and convenience while camping and that can fill in as a guest bed in a pinch should consider the Coleman Airbed Cot. Intex designed the Supreme Air Flow Bed to combine comfort and support. The top surface is flocked, which keeps the sheets from getting tangled or slipping at night. There is a built-in pump that is both efficient and powerful. In fact, it inflates the bed in under three minutes. The sides and top of the air mattress are constructed with a network of interconnected air cells. There is also a durable dual chamber construction of coil beams in the upper chamber and I-beams in the bottom chamber. Once inflated, the Supreme Air-Flow Bed is twenty inches off the floor. This makes it helpful for people with mobility issues or if you are just sore after a long day of hiking. The Aero Sport All-Terrain Bed comes with a dual power pump that is rechargeable from home or runs instantly when plugged into a DC 12V car lighter outlet. The pump is strong and inflates the bed in under a minute. And, the quick-release valve allows it to deflate in about fifteen seconds. You get a good level of support and comfort from the built-in pillow and coil construction. It also has a plush, velvety sleep surface. In addition to working well while camping, you can use it for overnight guests. 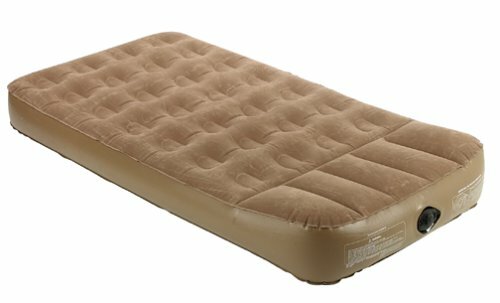 Those of you looking for the convenience and comfort of an indoor bed in a moderate to large camping space will appreciate this air mattress. Essentially, the key to finding the best air mattress for camping is knowing what you want. There is no one air bed that will be perfect for all campers. However, the above options are among the best on the market. If you do your research, you are sure to find one that is right for you.